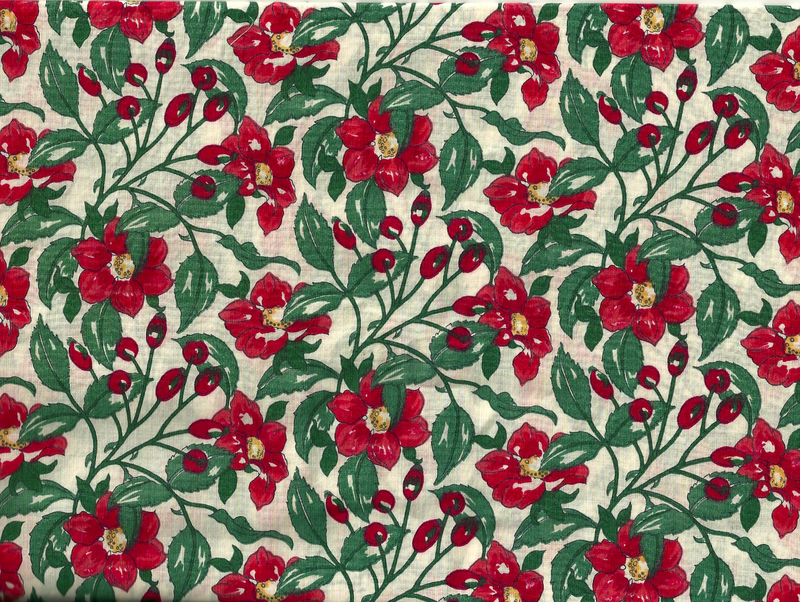 I found these Liberty fabrics last year on Fabric.com and immediately ordered yardage in two colors. They stayed tucked away in my fabric closet until early March when I got serious about getting these dresses sewn. 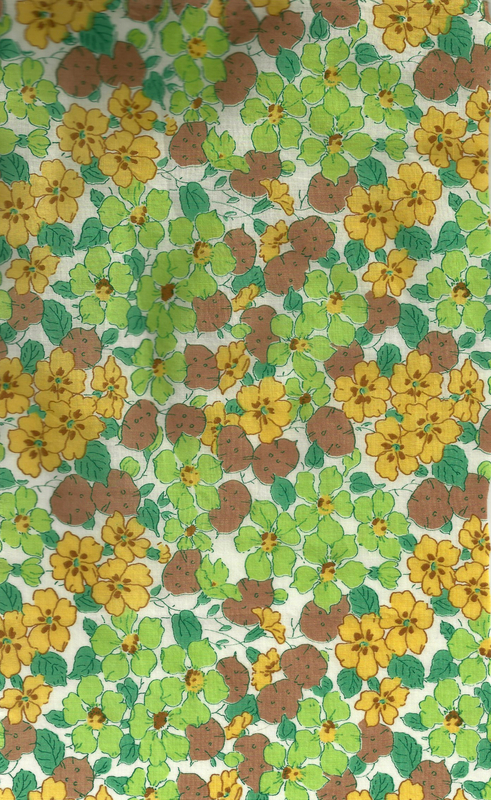 All along I intended to pair each print with 16thinch coordinating cotton gingham, and then I set about finding a pattern which would accommodate this idea. I ended up using a Children’s Corner pattern (Louise) which turned out to be the perfect choice. 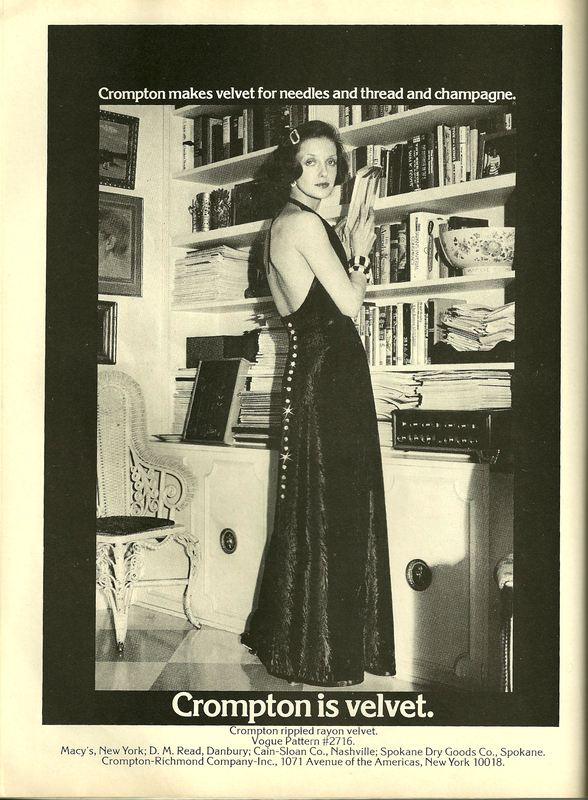 View B showed a hem band and collar in contrasting fabric to the rest of the dress. 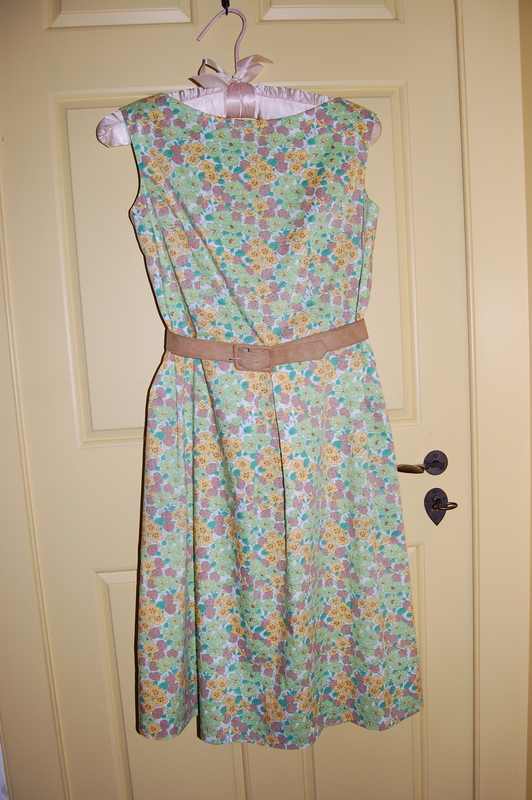 View B includes the Peter Pan collar and hem band. 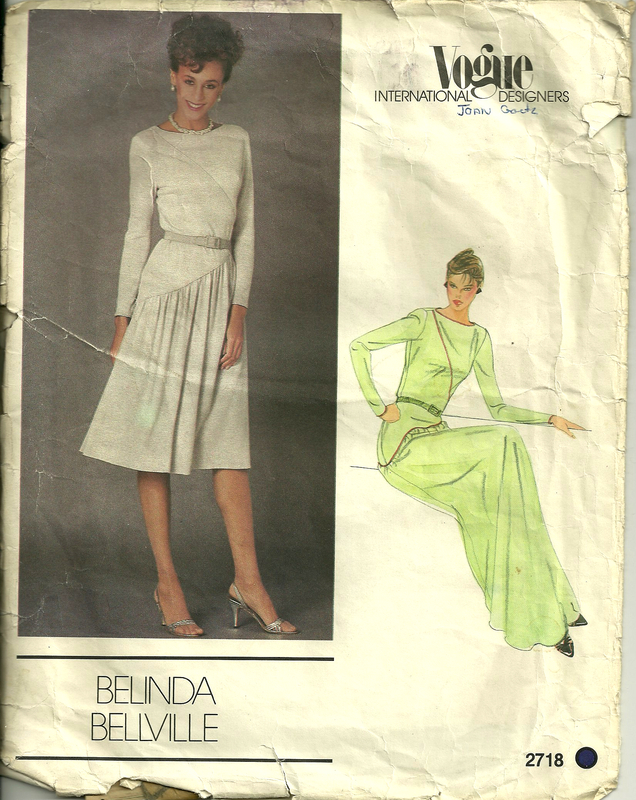 These dresses are quite simple to make, and the pattern is precise. I really, really like that this company gives you separate pattern pieces for each size in the envelope. 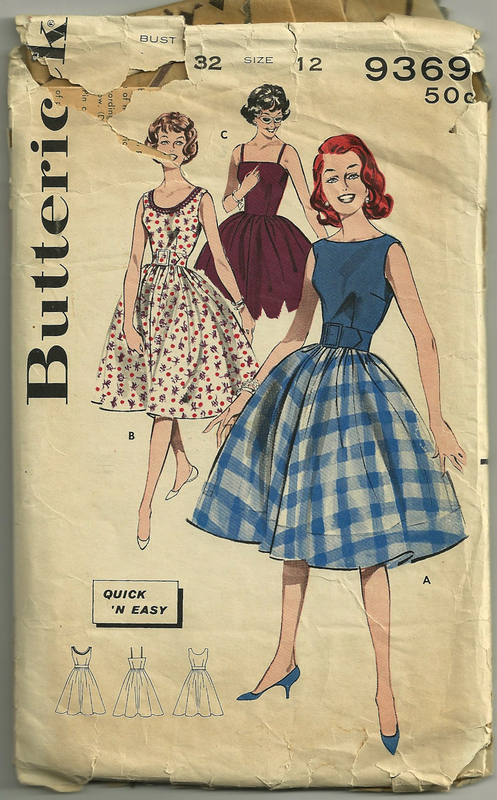 For example, this pattern included sizes 1 – 5. 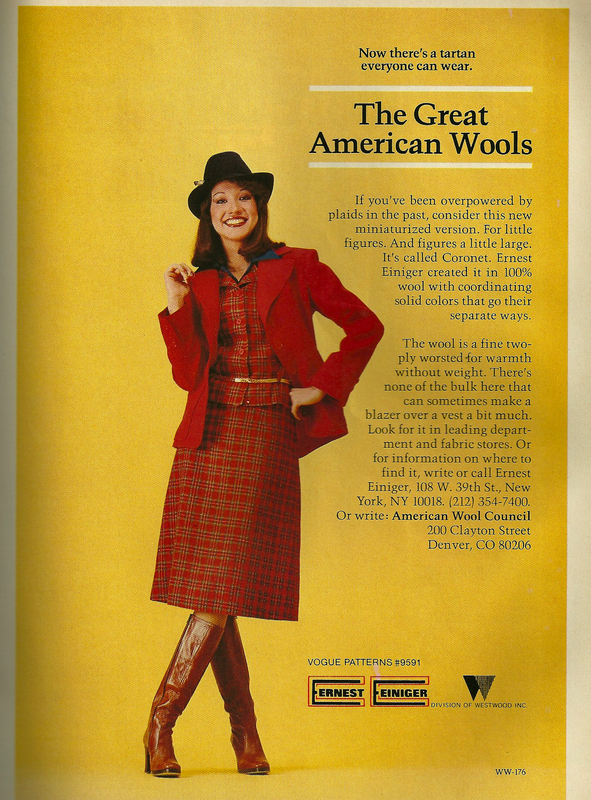 So – there are full patterns for each size. I used size 3 and size 5, and it was such a pleasure not to have to trace a pattern for each dress. 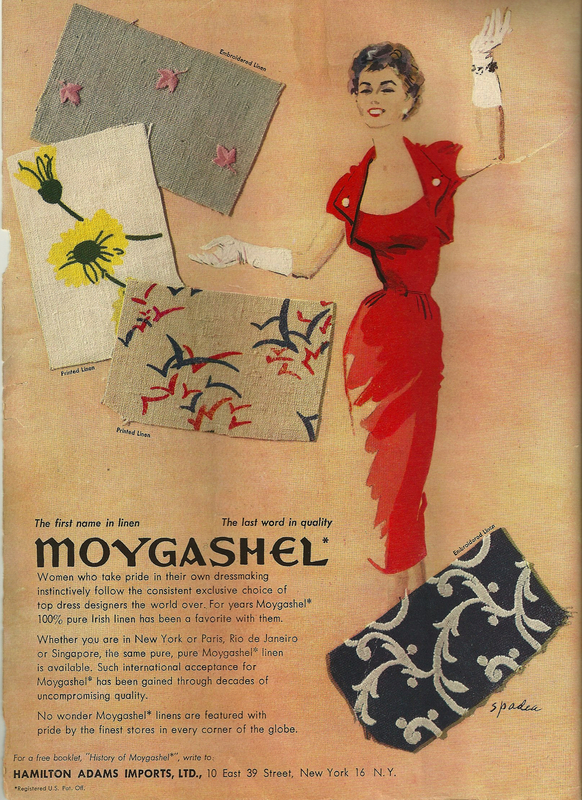 Mysteriously, the seam allowance allotted for the pattern pieces was only ¼”. I increased it to a standard 5/8” as I am much happier sewing with a more substantial seam allowance. 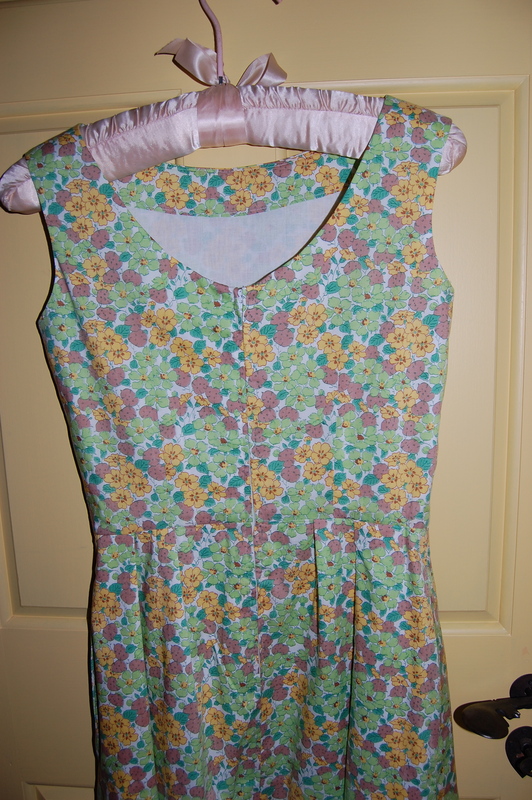 The only other changes I made to the pattern were to make the back opening button on the left side rather than the right side, and to add three decorative buttons to the bodice. I needed to move the bottom button on this dress as it was not quite lined up! First I made the size 5 dress. I realized once it was well underway that a touch of rickrack would add so much more interest to the dress. Finding lilac colored rickrack was quite the task, but once again an Etsy shop (Creative Trims) had just what I needed. Looks too plain without some additional embellishment. The rickrack looks so much better! I applied the rickrack by hand. The second dress came together quickly (for me, at least!) Making the dresses alike, but in different colors was an idea I liked, and I was hopeful that the girls would like that, too! I am happy to report that, according to my daughter, the little girls love their birthday dresses. Time to start planning for next year! William Allen Butler (1825-1902) may have thought “Nothing to Wear”, from which these lines are taken, was a satirical poem, but he obviously did not know 21st century fashion sewers. 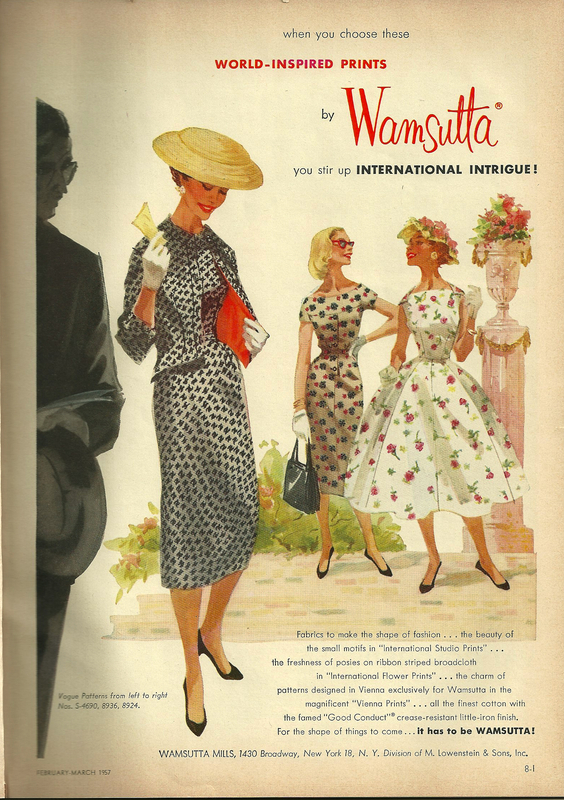 Isn’t January just the perfect time to plan for the creation of “dresses for Winter, Spring, Summer, and Fall”? Yes, thank you for agreeing with me. Last year I took a rather theoretical approach to the new sewing year, but this year I am focusing on more specific plans. Let me start with Winter. 1) My Chanel-inspired classic French jacket is my current project, and I am happy to report that I am making slow but steady progress on it. 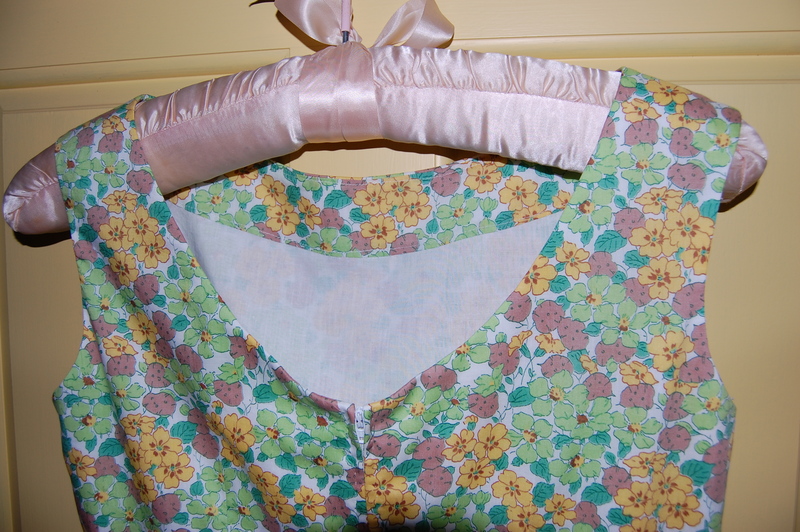 2) I won’t consider the jacket really complete until I have made the bow blouse that will match its lining. 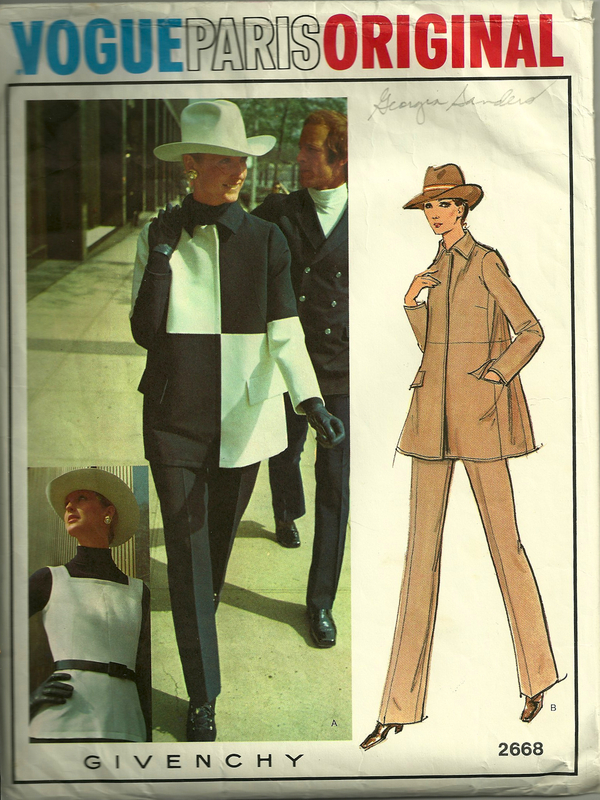 3) I am excited to say that I am going to be joining one of Susan Khalje’s Couture Sewing Classes in February, and my intended project is — ta-daa — this jacket which I have wanted to make ever since Vogue Patterns first issued it in the 1970s! I will definitely be doing the color blocked version when I make this coat. 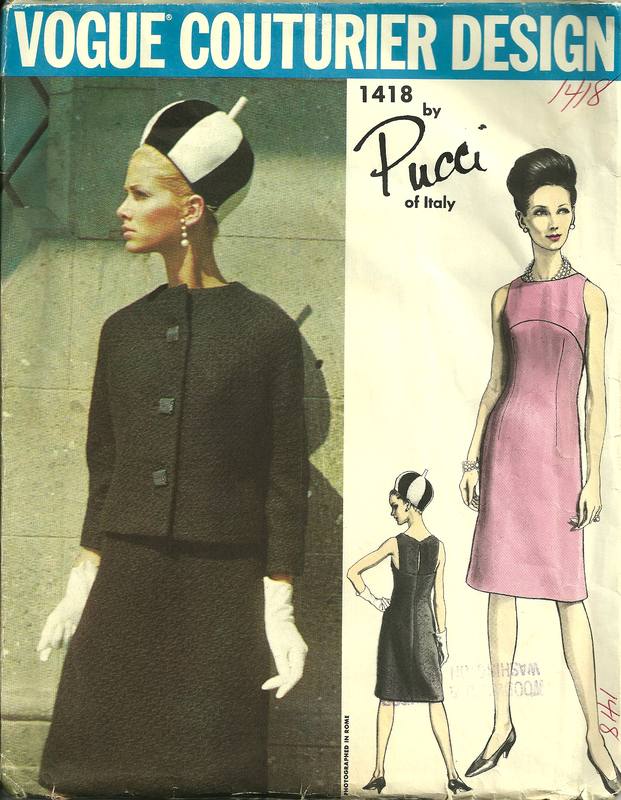 I have an authentic Pucci silk from which to make the dress and line the jacket. In addition, Spring will not be complete for me until I make a dress for my granddaughter who will be 1-year-old in March. 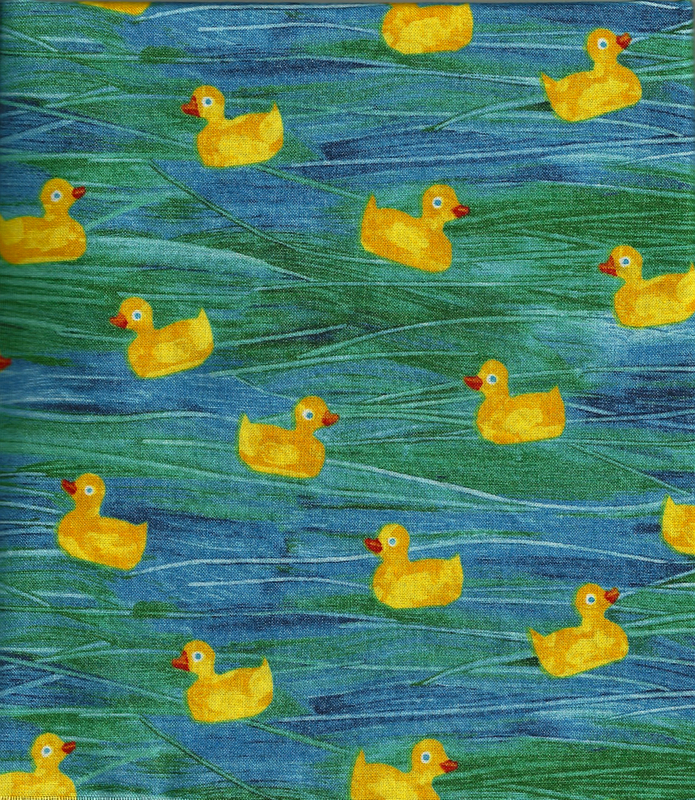 I purchased this fabric last Fall when I was at the Eric Carle Museum in Amherst, Massachusetts. You can imagine my excitement when I saw that the gift shop included yardage of soft, quality cotton featuring designs from his books. I envision these little ducks embellished with yellow rick-rack. 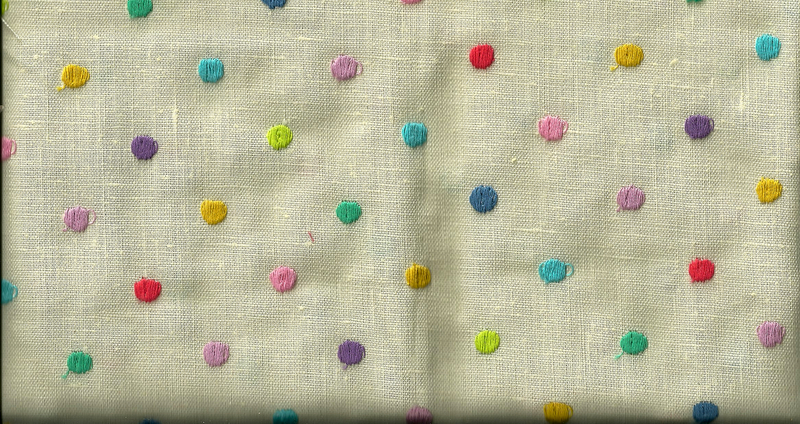 I only have one and 5/8 yards of this 35″ wide fabric, so it remains to be seen if I can squeeze pants out of it. And a bathrobe!! I am dying to make a swishy bathrobe! 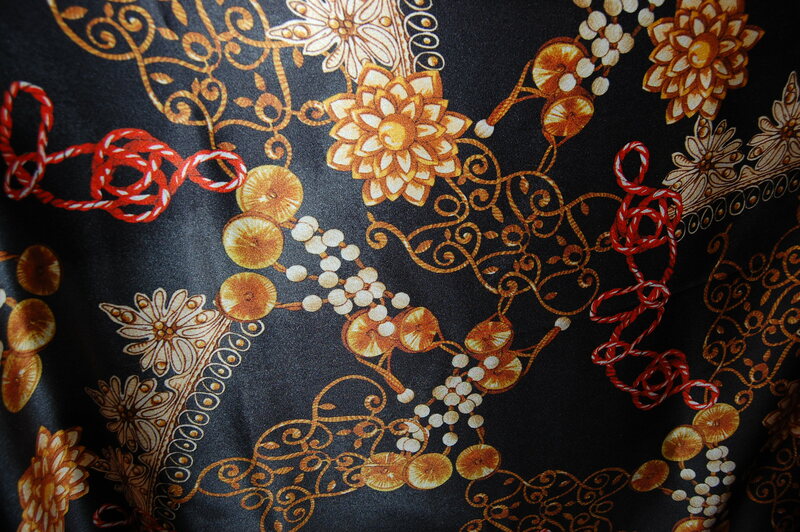 1) I found this stretch silk charmeuse at Mendel Goldberg Fabrics on a quick day trip to NYC in early Fall. I bought it thinking I may use it for the lining for my No. 2 French jacket, but shortly after that I found this pattern on eBay and promptly decided it would be perfect made up in this dress (which requires a stretch fabric. Well, it says “ knit fabrics only” but I say stretch fabric will do just fine). 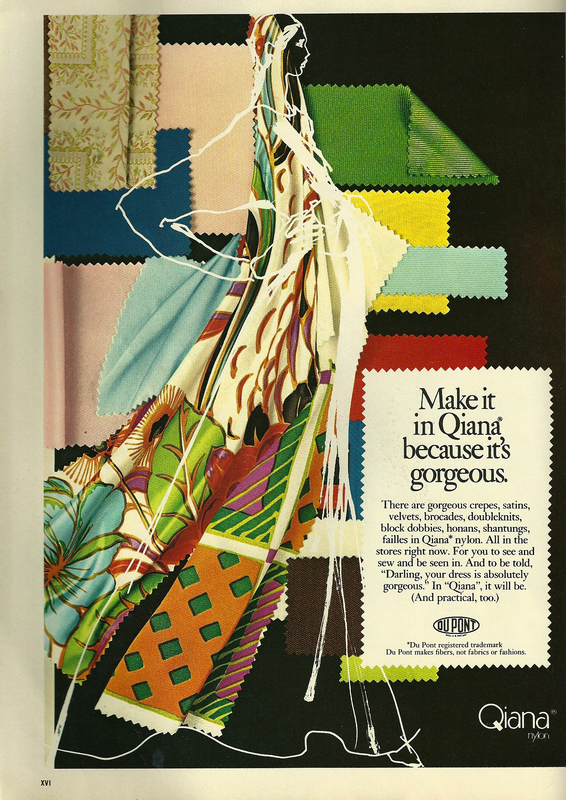 This is one of the few patterns from the 1980s which I really like. However, I will not be duplicating the hairstyle. 2) I’ve had this buttery soft cashmere wool for a couple of years now. 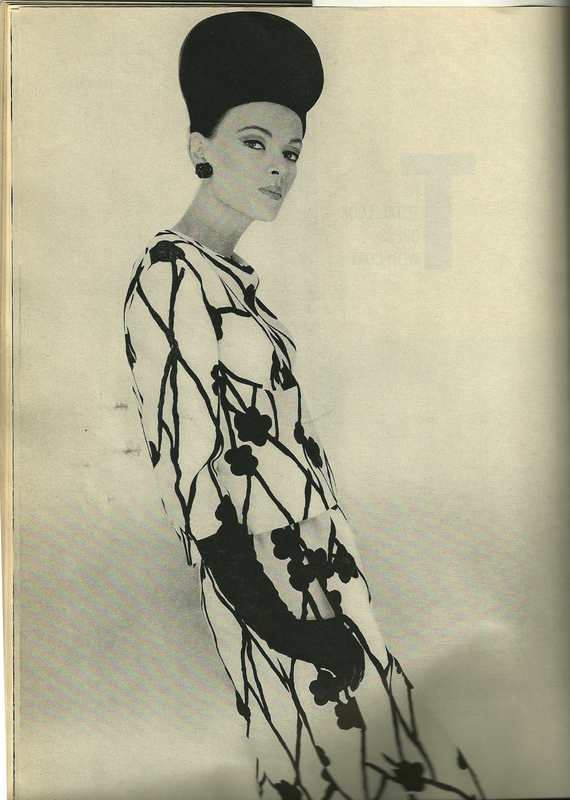 I originally thought I’d make a suit, but now I’m thinking long-sleeved dress instead. I’m still sorting this one out in my head so I’m very glad I have until next Fall. 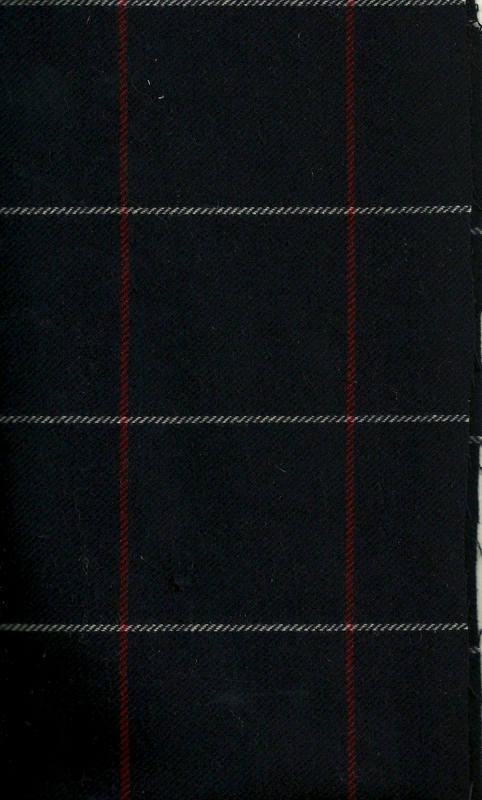 A subtle windowpane check in navy with deep red and ivory intersecting lines. Sprinkled among these plans for Winter, Spring, Summer and Fall will surely be more little dresses for granddaughter Aida. I fully intend for her to have some of the cutest frocks in all of New England. Finally, if 2013 taught me anything, it is that the unexpected is waiting around every corner. 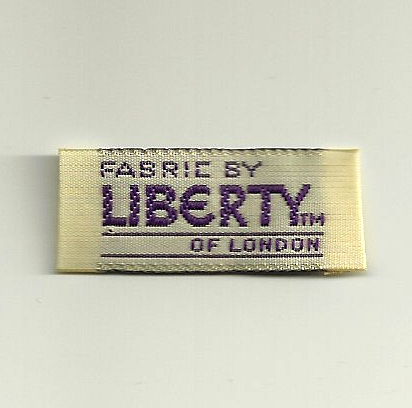 Lots of corners lurking in this Liberty cotton! Life can take sudden turns and twists that are not always sewing-friendly, so I plan to be kind to myself if that happens. But wouldn’t it be nice for all of us to have the kind of year when we have the extra time to make a dress in which to do “nothing at all”? Give me Liberty . . . 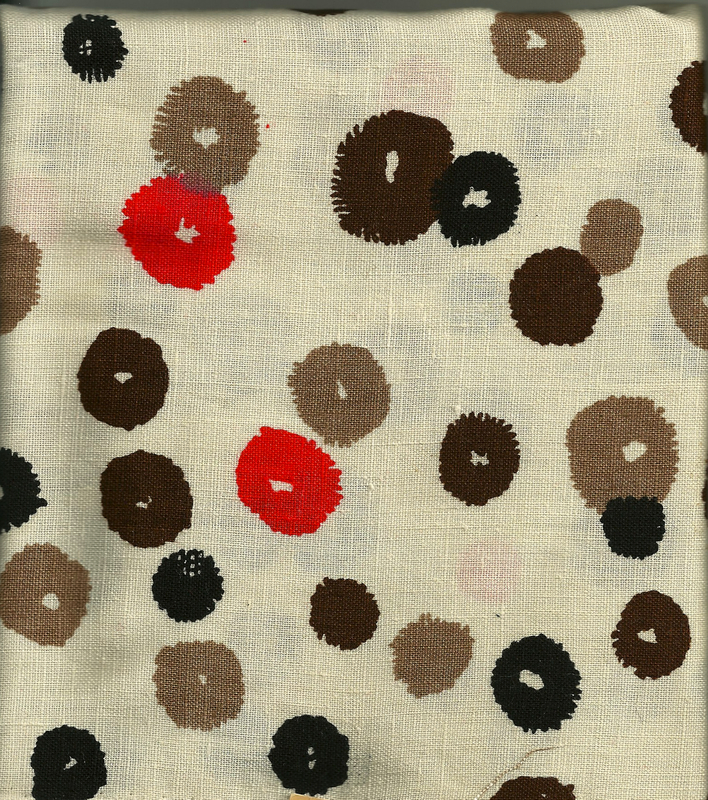 I find the colors and design of this cotton so appealing. 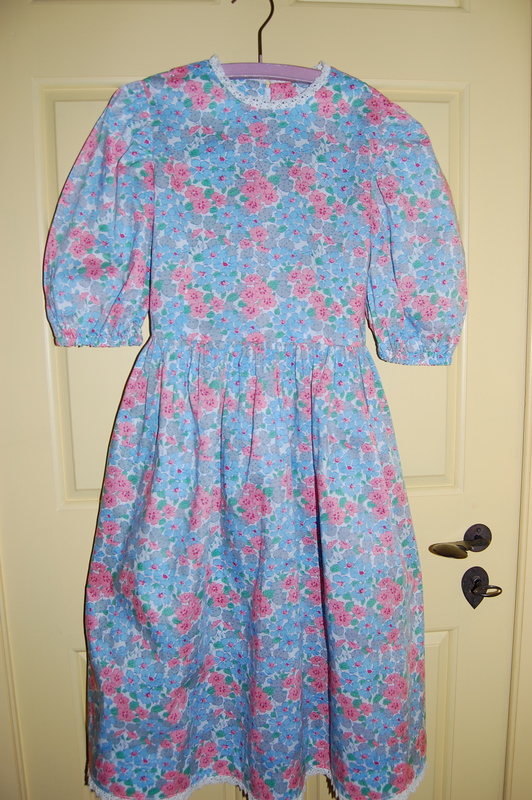 It sat in my fabric drawer for about another 12 or 15 years, until I finally made it into a dress for my daughter when she was about 8 years old. 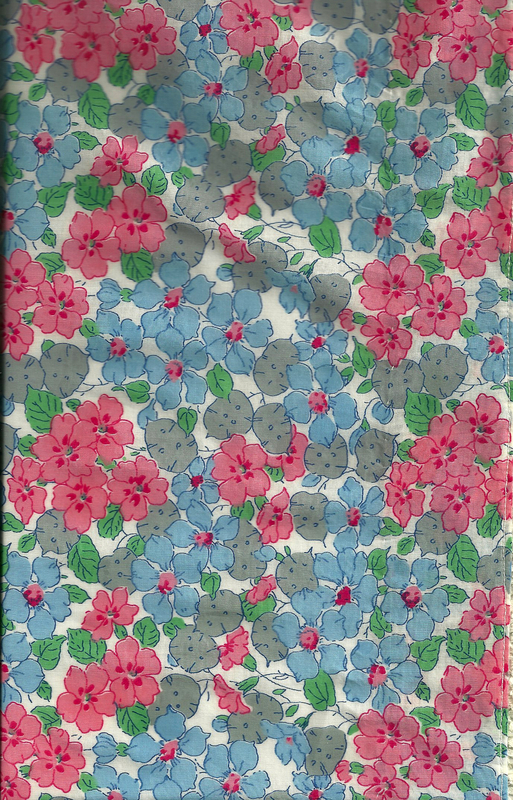 The only reason I saved this dress is because of its vintage Liberty fabric. The second piece had a bit more yardage to it, but it, too, sat in my fabric closet, until last Summer, when I finally decided I would make myself a dress. This is the same fabric design in different colors. I chose this pattern primarily for the bodice in View A (the blue one). I did not have enough fabric left to make a self belt, so I have worn it with one I already have, until I can find one I like better! I really like the back of this dress. Here is a close-up of the back neckline. Well, it seems I am always rediscovering pieces of fabric in my extensive collection, and although I have known this fabric was there, it always seems like a new discovery when something so pretty surfaces again. 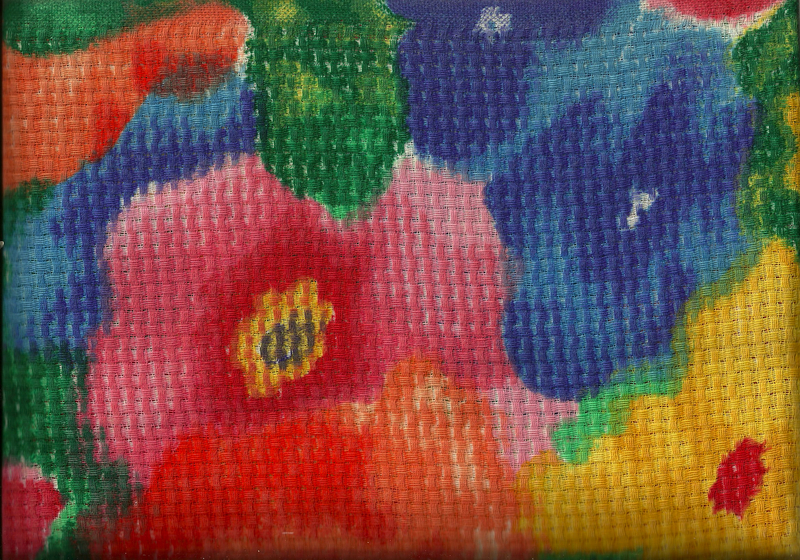 I purchased this piece of Tana Lawn in Bermuda (probably at Trimingham’s, now unfortunately out of business) sometime in the 1980s. 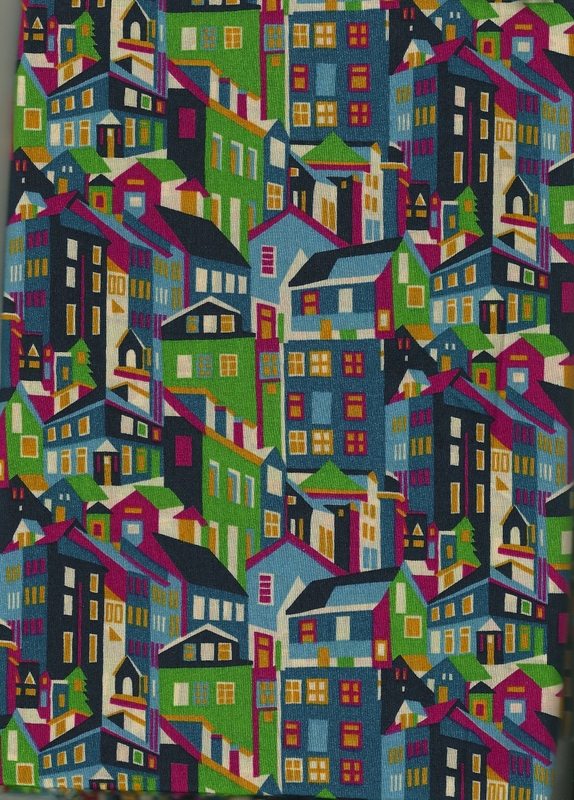 I still love this fabric over twenty-five years after purchasing it! 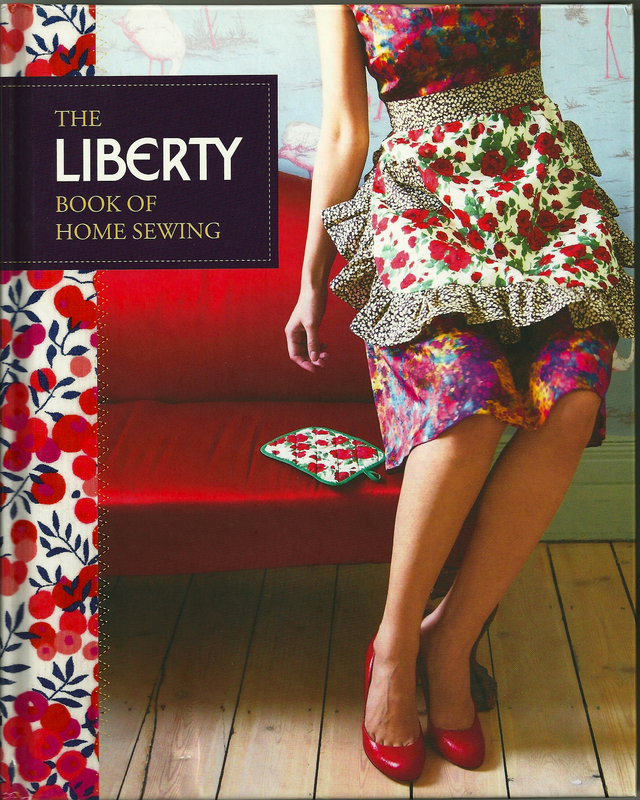 Now, about that afore-mentioned book: last Summer I was browsing books on sewing and fashion on Amazon, and The Liberty Book of Home Sewing popped up for pre-order. Being a complete push-over for any books which showcase beautiful fabrics, I signed up for it and it arrived in October. Of the 25 projects featured, my favorites are the vintage ‘50s look apron on the cover and the peacock pincushion. 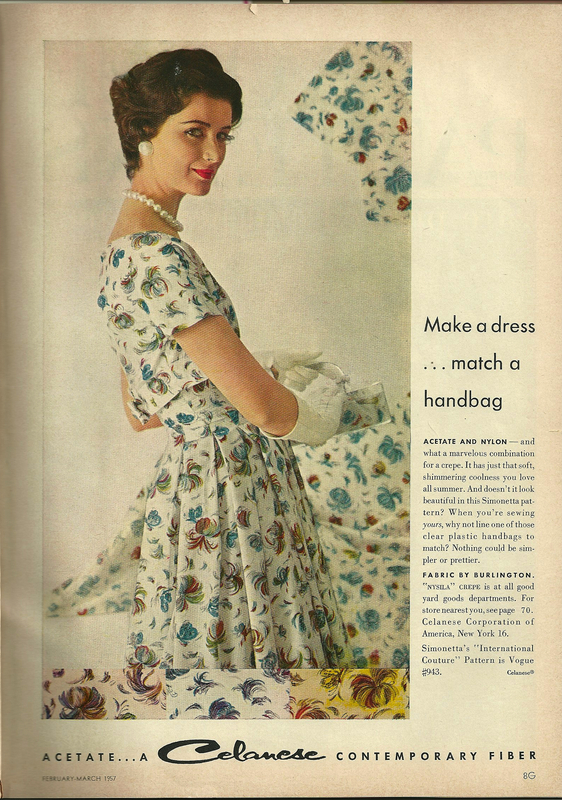 This is the cover of the hardback book, showing the frilly '50s' style apron. 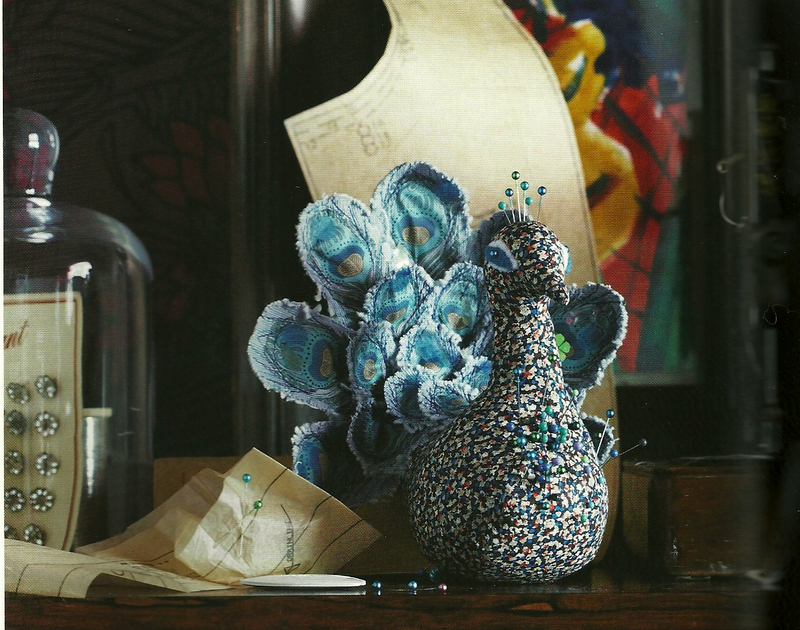 And here is the whimsical peacock pincushion project. 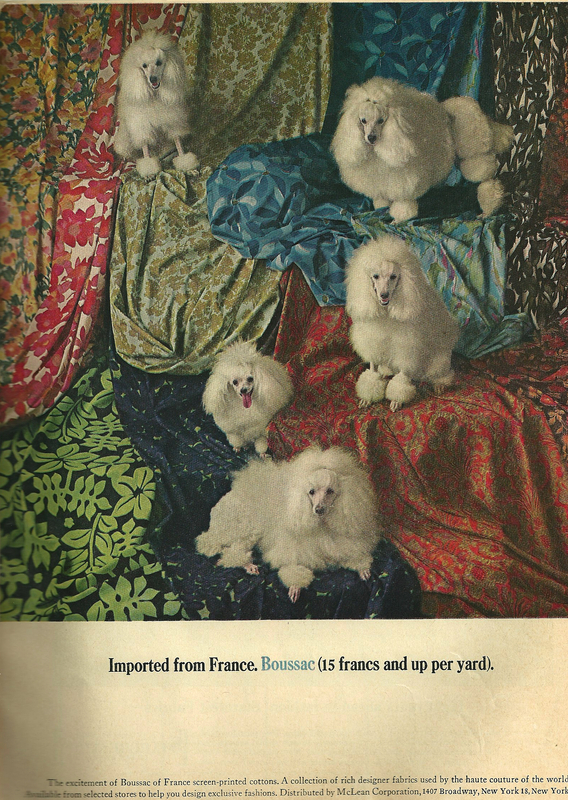 What I really like about this book, however, are the full-page representations of Liberty cottons; the Glossary of Fabrics, which includes a little history about each featured design; and the Foreword, which includes a history of the production of Tana Lawn. 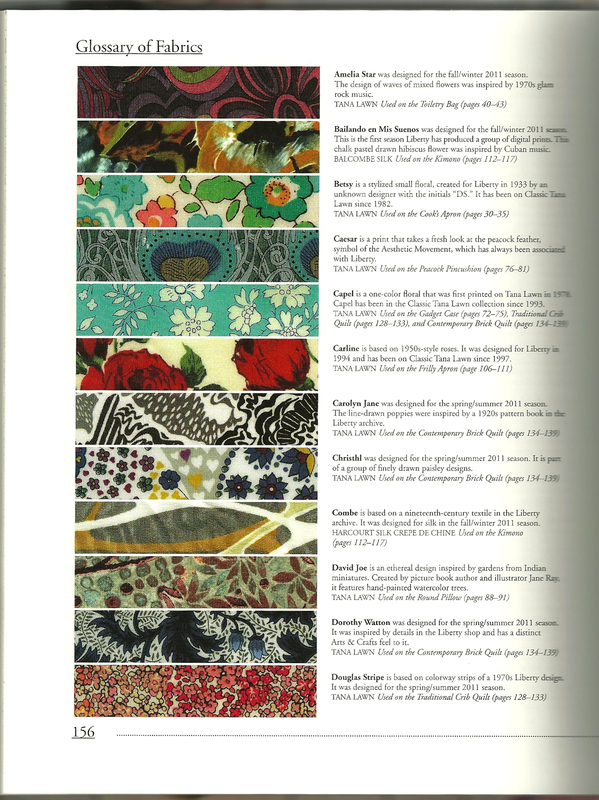 Here is one page of the Glossary of Fabrics. This tag is small, but packs a powerful message! I'll definitely be sewing it into whatever dress I eventually make. What is it about a label that can give a fabric or pattern purchase – and ultimately the finished garment – its own persona? How can something so small add so much validation and completeness to the dressmaker’s labor of love?